Humans being are scared because being scared is human. Terrorism in Western Europe Used to Be Much Worse read the headline in Mother Jones. 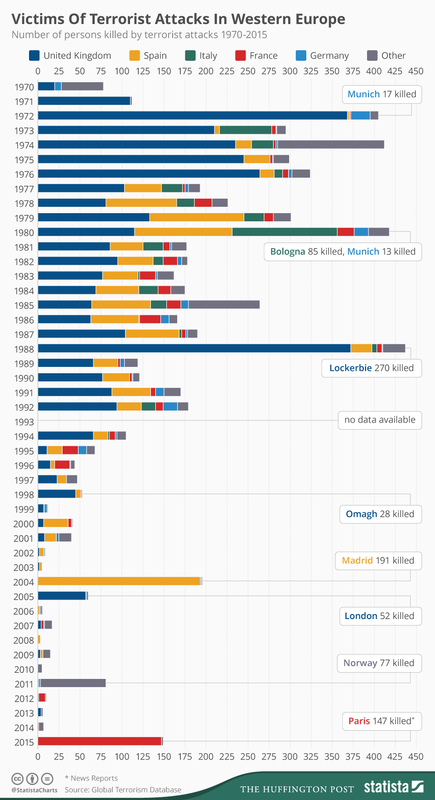 Someone asked if terrorism is so much lower than it was forty years ago–see the chart below, the difference in scale is dramatic–then why is fear up so much? Probably because there is nothing else to be afraid of. Human beings, having evolved under constant predatory pressures, are by nature very fearful. Back in the 70’s Americans were scared shitless of terrorism, but we were also worried about World War 3 and an incredibly high crime rate and some truly scary serial killers. Fear was a continuous presence, and there was much to be genuinely afraid of. Now there is a lot less to be afraid of, very little even. So we focus on terrorism. People will always be terrified of something. Our very intelligence, the incredibly high level of human cognition, developed in response to our terror of predators. It probably even was one of the factors in the development of language. (Think of vervet monkeys, with their distinctive cries of danger for leopard, snake, eagle.) We can’t live without fear. People who are naturally without fear literally have something wrong with them…. and those eastern techniques people use to attain inner peace–that is, freedom from fear–require extraordinarily intense concentration and practice to overcome our intrinsic fear. Homo sapiens are the only surviving human species out of dozens, and it is assumed that nearly all the other species were driven to extinction by predatory pressures. Life in the plains was extremely dangerous. We remain the sole survivor because our ancestors were the only one who developed technology to help us fight back, and did so an incredibly long time ago. Homo habilis had developed tools way over two million years ago, which means they must have already been using stones as missiles, much like baboons do. Our survival strategy was probably much the same as baboons–groups that defended aggressively against predators, except that baboons can live in very large groups because they are primarily plant eaters, and we were forced to live in smaller groups because we ate mostly meat. That made us much more vulnerable to predators–especially leopards (in fact, leopards still kill scores of people annually). Therefore we had to have a much more acute wariness about leopards (which are ambush hunters), which helped us survive where every one of our competitors failed. Being scared all the time was not only a survival strategy, it made us human. Incidentally, of the four surviving genuses of hominids, three–orangs, gorillas and chimps/bonobos–all live in dense forest, which protects them from predators. We are the only genus that survived in open country, from H. habilis through H. erectus to H. sapien. And we did that by be incredibly wary. Even now, living in completely artificial homes surrounded by all this technology and never eating anything we killed or harvested ourselves, we will always find something to be freaked out by. Fearing sudden attack by terrorists is not that different from fearing an ambush by a leopard. Leopards, in fact, may have evolved as hominid eaters, as both they and we evolved as species at the same time. As prey we may have actually been a prime driver in their evolution. You look at a leopard and you might be seeing a cat designed to kill you, specifically. There is no other predator designed to eat us. Leopards certainly are much more adept at hunting us than are lions or cheetahs. Leopards even have human-specific methods of killing us, preferring to catch people indoors while they sleep. They haunt Mumbai by night, taking a dozen or so of us in a bad year within the city limits. They are epicures of humans as food, oenophiles, sometimes killing one of us with quick bites to the neck, then tearing open the throat just to lap up the blood that pools on the floor. They drink their fill and slip out the way they came in, unseen, leaving the meat uneaten. After writing that, I walked over to make sure the door was locked. There are killers and terrorists everywhere.